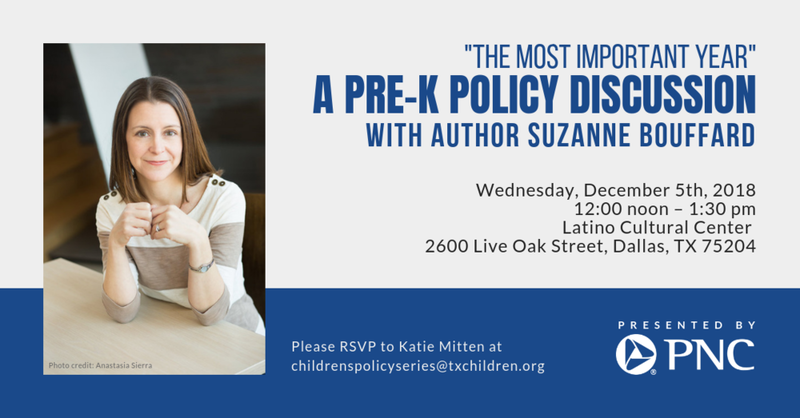 Please join us on December 5th in Dallas for a discussion with Suzanne Bouffard about her book, "The Most Important Year: Pre-Kindergarten and the Future of Our Children." Ms. Bouffard will discuss lessons learned from Boston and other communities that are investing in high quality pre-k and how those lessons could be applied in Texas. Thank you to our event sponsors: PNC, Early Matters Dallas, and the Texas Education Grantmakers Advocacy Consortium (TEGAC).